Can employers use information from their employees’ Facebook pages in managing the employment relationship? Not an age-old question, but one debated in recent years. In many provinces, the answer was “yes”. But in other provinces such as Quebec, some commentators took a more cautious approach. In a recent decision, the appeal division of Quebec’s Workers’ Compensation Board (the Commission des lésions professionnelles) said "yes" — employers may use information learned from their employees’ Facebook account if there is nothing to suggest that the account’s contents were accessed using fraudulent schemes, subterfuges or other underhanded means. In 2011, a worker hurt her shoulder at work. About six months later, she was diagnosed with adjustment disorder with mixed mood. When she appeared before the commission, the worker asked that her adjustment disorder and employment injury be declared related. Before starting the hearing, the worker asked that excerpts from her Facebook page that were in the commission’s file be excluded from evidence. The worker was active on Facebook throughout her absence from work — often mentioning her mood and her dissatisfaction with the way her compensation file was being handled by the commission in her posts. • She had no idea how the excerpts wound up in the commission’s records, although acknowledged that the information may have been communicated by one of her other Facebook friends. The commission dismissed the worker’s objection, citing the principle that all evidence is admissible provided it is relevant — in order to discover the truth. The exception to that rule, according to the commission, is if rights and freedoms have been violated and the evidence is likely to bring the administration of justice into disrepute. In this case, nothing suggested that access to the private contents of the worker’s Facebook account resulted from fraudulent schemes, subterfuges or other underhanded means. The case was very different from Campeau et Services alimentaires Delta Dailyfood Canada Inc., where the employer had created a fake Facebook account in order to become "friends" with the worker. There was no such fraud in this case and, as such, the evidence was admissible. Even in a province like Quebec with many privacy protections, the door has been opened for employers to rely on employees’ Facebook postings so long as there is no fraud or other underhanded schemes. This supports the view long held in other provinces that information posted on Facebook, other social media sites and the Internet by employees is "fair game" for employers. • N.D. et Commission scolaire A, 2013 QCCLP 2138. • Campeau et Services alimentaires Delta Dailyfood Canada Inc., 2013 QCCLP 7666. Frédéric Parisien is a member of the Labour, Employment and Human Rights practice group with Fasken Martineau DuMoulin in Montreal. He can be reached at (514) 394-4513 or fparisien@fasken.com. 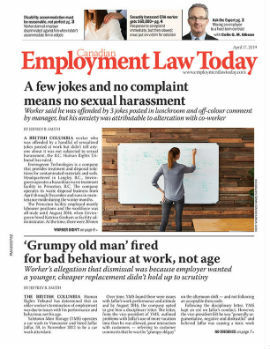 This article was re-published from the e-bulletin, HR Space, with the permission of the law firm Fasken Martineau DuMoulin, LLP (www.fasken.com), as well as the publishers of Northern Exposure, a blog written by the law firm's lawyers. Northern Exposure is produced in conjunction with HRHero.com. You can read more Northern Exposure blog posts at http://blogs.hrhero.com/northernexposure.